Spoil yourself this Summer with a pair of beautiful printed French pajamas. Enjoy a blissful bedtime in loose, lightweight sleepwear patterned with dreamy designs. 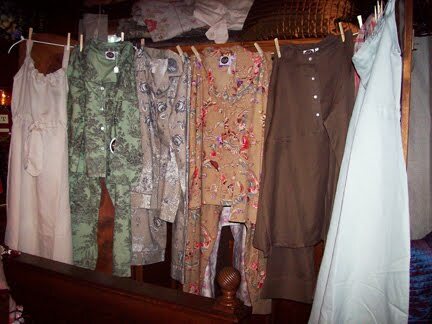 Comfy, cozy pajamas pair collared cotton tops, with button closure, with either full length pants or Capri length pants (in most collections). Pajamas are 100% cotton, machine washable and available in small, medium, large. 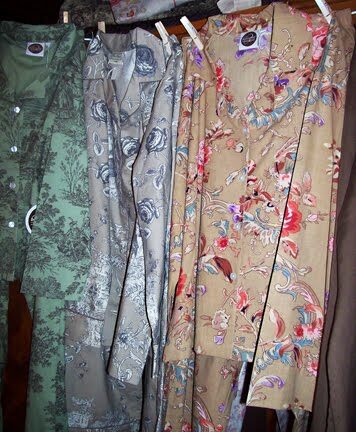 The brown linen pair would be even nice to wear as casual wear! The Paris-based company has a design style that is deeply rooted in the French artisan traditions of Provence, where every aspect of life is inspired by the abundance of nature. Handmade with care and the utmost attention to detail, intricate 18th century French prints are produced by master artisans in India. Twice a year (Spring/Summer, Fall/Winter) new designs are introduced that complement existing patterns for easy mix & matching. The fanciful character and luxurious fabrics of these wonderful pajamas will certainly bring you sweet dreams! Prices range around $68.00 a pair-We will be happy to ship to you as well! Featured Mary Frances Bags This Week!